Reviews from Clients After carrying the ceramic infused Loba Supra AT water based polyurethane for several months, we finally have feedback from our clients. The reviews are outstanding. the case of the water based polyurethane Loba Supra AT, we’ve already had three (3) enthusiastic reports come back to us telling us how beautiful the product is. In the flooring industry, it is best when clients are “silent” after the installation of their floor. This means they have no complaints about products or services. It is special, in this day and age, to have customers take the time out of the day/lives to contact a company regarding the EXCELLENCE of a product. Normally clients reserve the comments for when something goes wrong or the product is not living up to the hype. 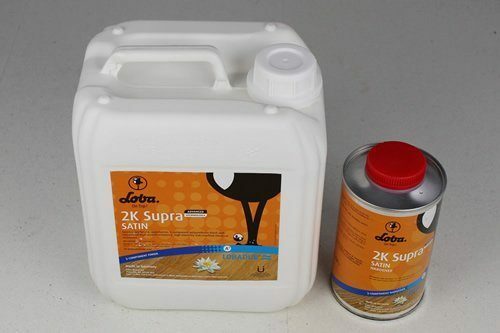 In the last four (4) months iCork Floor has received multiple compliments regarding our newest product – water based polyurethane Loba Supra AT Satin polyurethane. It flows beautifully – bubbles self-correct and it is self-levelling (should too much or too little be used in one place). It is smooth and silky to the touch. Despite the extra “toughness” of the finish, the cork floor remains silky smooth and soft under foot. It cures “faster” than advertised. Several clients have already stated they did not wait the recommend three (3) days before they moved their furniture back in. The finish was ready and able to handle shoes, rugs, furniture and pets without any trouble. “Sticks” to any situation given to it. Adhesion to another floor finish is always a concern – but the Supra AT has no problems grabbing onto (and not letting go) of less than perfect finishes. Granted this is only when applied over Forna’s factory finish or a “ruined” Polywhey finish, but this bodes well for other applications. Low slip finish. The traction that Supra AT proves has improved the already “grippy” performance of Cork Flooring – a “low slip” flooring option. Beautiful low gloss Satin finish. The appearance of the cork is enhanced after the application of Loba Supra AT.